Vintage folding cameras usually have front element focusing. Over time, these may have been moved out of alignment. The professional way to align the focus at infiniti is to use an autocollimator. There are other ways of aligning the focus using a second SLR as a collimator which is decribed here or here. 1. Wax paper can be used as a temporary substitute for ground glass. Cut a cardboard frame that will fit the base of the film gate. The cardboard provides some rigidity to the wax paper. Cut a piece of wax paper and tape it tightly against the frame. 2. The distance ring is attached through three small set screws. 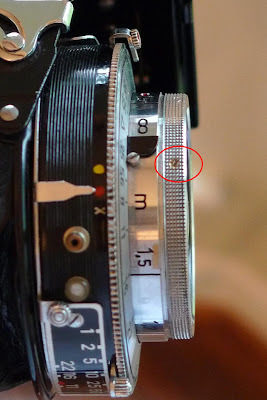 It is not the bigger screw which simply acts a stopping device when turning the focus ring. Unscrew the set screws and remove the distance ring. You can unscrew the front element all the way, but don't. 3. Mount the camera on a tripod. You'll need the camera to point at a faraway object. Place the camera in a shaded area and the subject to be bright so you can see the best. Out a window or and open door works well. 3. Open the back and tape the frame to the film gate. 4. Open the aperture to the widest setting. Open the shutter to "B" or "T". 5. Focus the lens. Use the jeweler's loupe to help determine best accuracy. 6. Replace the focusing ring and tighten the set screws. Thanks so much this is genius work. Wax paper! I am new to medium format film and I bought an old Voigtlander Bessa (no rangefinder, but quite similar to this one). My first roll came out really blurry so I was trying to determine if it was either A) camera shake/user error since I didn't use a tripod or B) a problem with the focusing being out of alignment or C) something else entirely. I am fairly confident, after using this test, that is just a function of me shooting handheld and not holding the camera steady. Though, I have had very sharp results on my grandfathers 100 year old Brownie handheld and without a tripod. I've also checked the lens on the Voigtlander and while it does have some specks on it, it doesn't appear hazy. If it isn't too much trouble- and if you're still maintaining this blog!- would you look at these and let me know if you think my suspicion is correct? Thanks! Sorry for the delayed response. I wish blogger would email you if there are comments. I rarely get ones so I rarely check. It has to be B) alignment error. Haze or spots in the lens would not make the image out of focus. Shake would produce a different type of blur - more streaky with a ghostly effect. Just a photo enthusiast with a blog, as a place to consolidate reviews, thoughts, and useless advice. I was 100% film until March 2012, before switching to digital. I loved using old film cameras, but the required processing time for every single photo, became too much with two young kids. So now I am digital, though I plan to break out the film again occasionally in the future.